about this book: Among Friends: Travels in Cuba was inspired by my four trips to Cuba between 2008 and 2015, during which I got to know a number of Cubans quite well by traveling with them, living with them or just talking to them. They showed me a Cuba I wasn't expecting, and a Cuba I fell more and more in love with each time I went there. My closest friend there is Julian, a university professor of medical English who never tired of answering my questions, telling me anecdotes about Cuban life and taking me to see churches and markets, waterfalls and beaches, concerts and plays. He should really get credit as my co-author, because so much of what I can now explain about daily life in Cuba comes from him. I wrote the book for tourists who are curious about "Cuba beyond the beaches". Maybe that would have been a good title. Or else, Far from the Tanning Crowds. I just wanted to excite people about how gorgeous and unspoilt Cuba is. And I wanted to give them some insight into how Cuban society works – how hard life is for them and how peaceful and well-educated Cubans are. 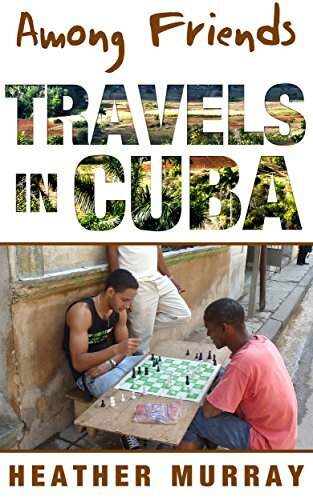 That's why I put my photo of two young chess-playing Cubans - one white, one black – on the cover. The book is about discovering Cuba for oneself, and I hope it gives tourists the motivation and confidence to stay and eat in private homes (casas particulares) and travel by shared taxi. It's not a travel guide because it reads more like a novel, but it does give readers a lot of tips about where to go and what to see. I'm using my blog to continue with tips and insights until I can update the book for eastern Cuba.